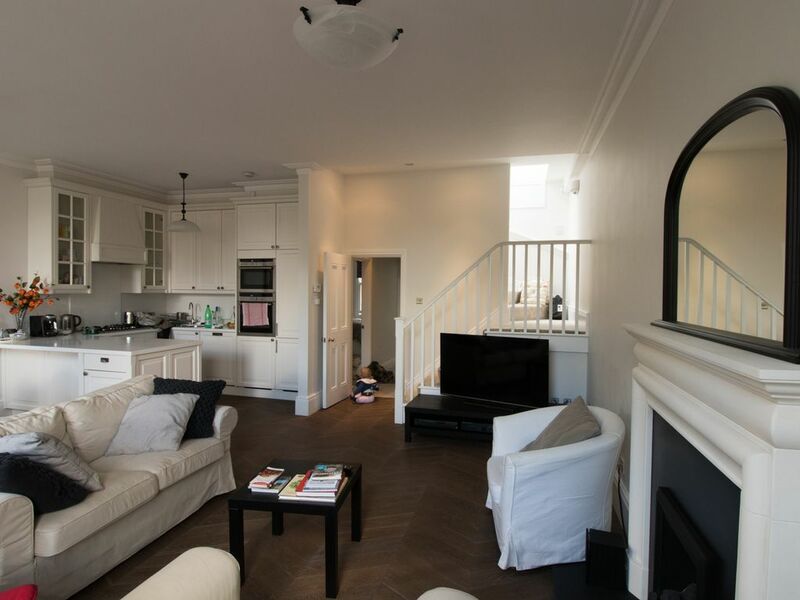 APARTMENT OVERVIEW Perfect for your stay in Central London! 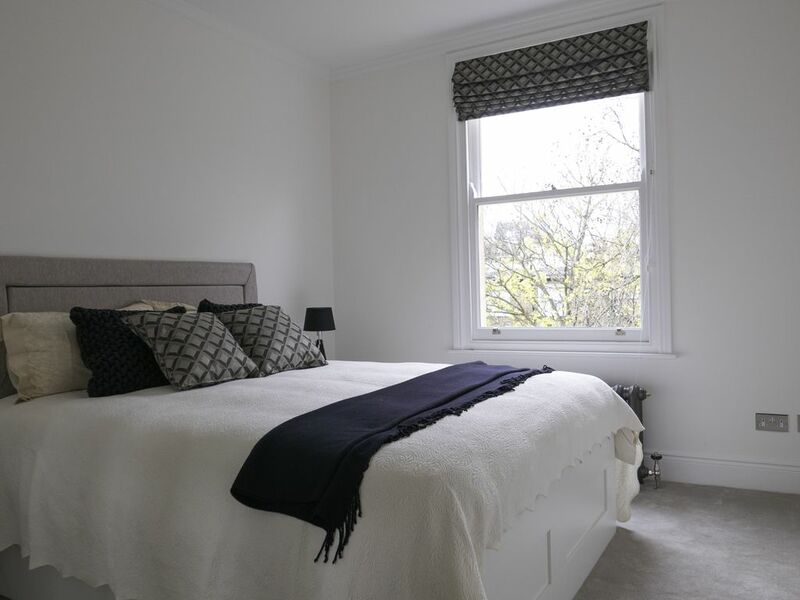 - This is a newly renovated and elegantly furnished two double bedroom two bathroom apartment of around 920 sq ft (85 sq m) in one of Kensington and Chelsea’s most beautiful and peaceful squares. 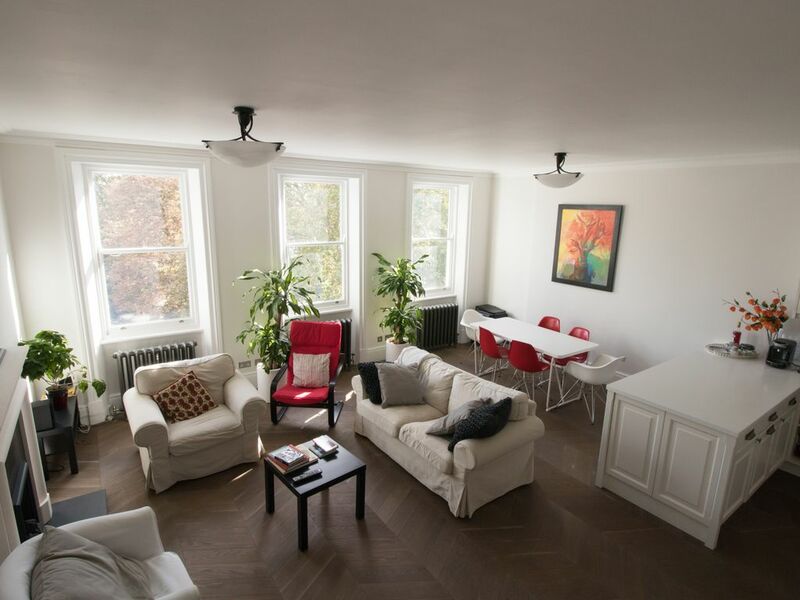 - The apartment would comfortably accommodate 4 people (two people sharing each bedroom) or a family with 2 children (3 children, if one of the children is young enough to sleep in the cot). 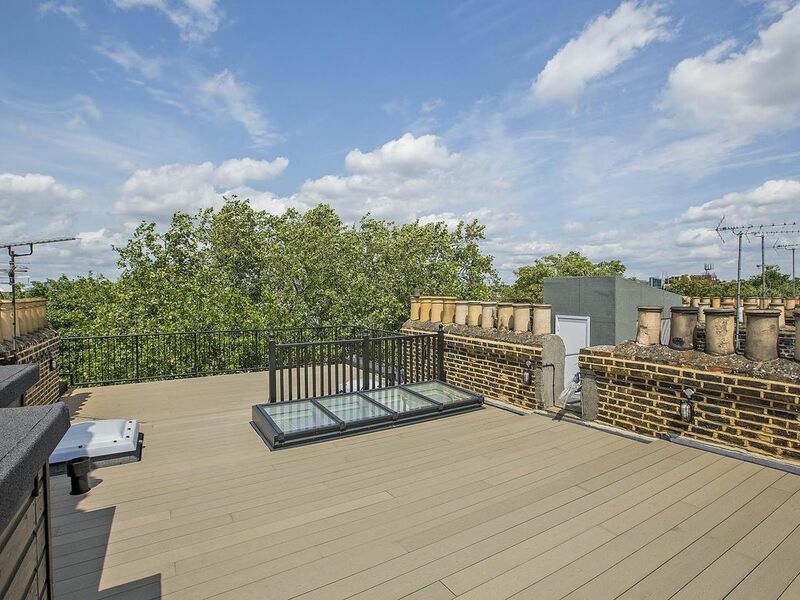 - Direct access to sunny roof terrace of ca. 80 sq m. I would be pleased to arrange access to the garden square (which is only open to the residents). - Fully equipped (two ovens, dishwasher, washer/dryer) - Very quiet square with limited traffic (both bedrooms are even more quiet enjoying location at the back facing an internal garden) - Nearest tube station is Earls Court (Piccadilly and District line) - only 30 min from Heathrow by car or 50-60 min on the tube THE APARTMENT The 42 sq m (21.5 ft by 21 ft) open plan living/dining room is south facing with three large windows offering beautiful uninterrupted views of the square. The bright living room has direct access to the large nearly 80 sq m sunny roof terrace. The custom-made kitchen is fully equipped with new appliances: gas hob, dishwasher, two ovens (conventional and combination/microwave oven), waste disposal system and fridge/freezer. The washer-dryer is discretely tucked into a built-in cupboard in the bathroom. Kitchenware, tableware and cooking essentials such as salt, sugar and oils are provided. Kettle, coffeemaker, toaster and Cuisinart kitchen processor are at your disposal as well. The dining area has a table for up to 8 people so perfect for family dinners at home. The sitting area has a new high-efficiency gas fireplace to keep you cosy and cheerful during the winter evenings!. If you need to do the laundry, the apartment has a new washer-dryer, steam iron and ironing board. You are welcome to enjoy the 50 inch smart TV, Netflix and Chromecast audio-based hifi, as well as Wifi (unlimited downloads). 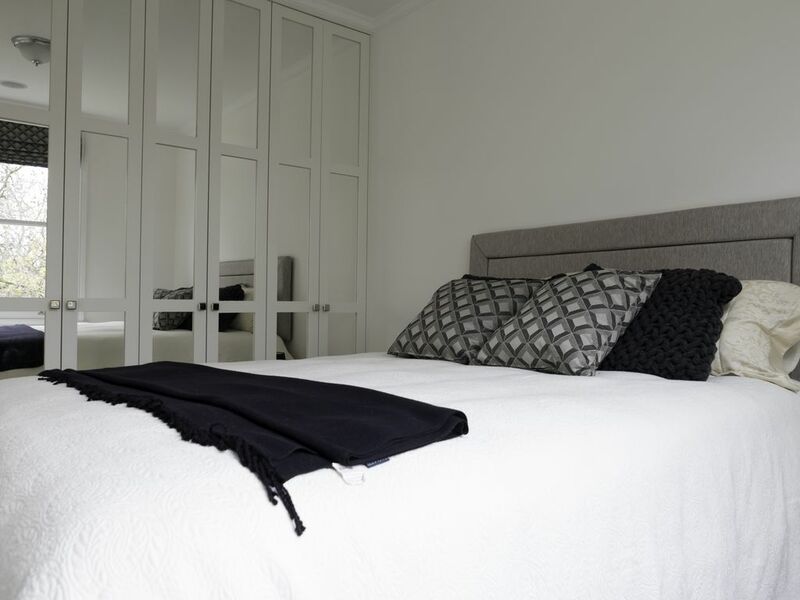 The master bedroom has a comfortable king-size bed and a very large fitted wardrobe complete with a chest of drawers. 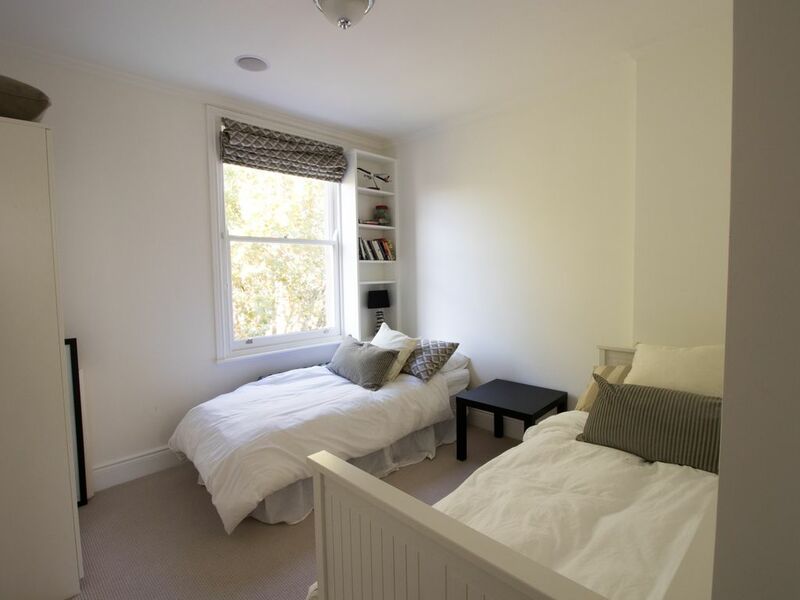 The second bedroom has a guest bed which can be converted into a large king size bed or, upon request, two single beds, depending on your requirements. A double door wardrobe is at your disposal. Bed linen and towels are provided. 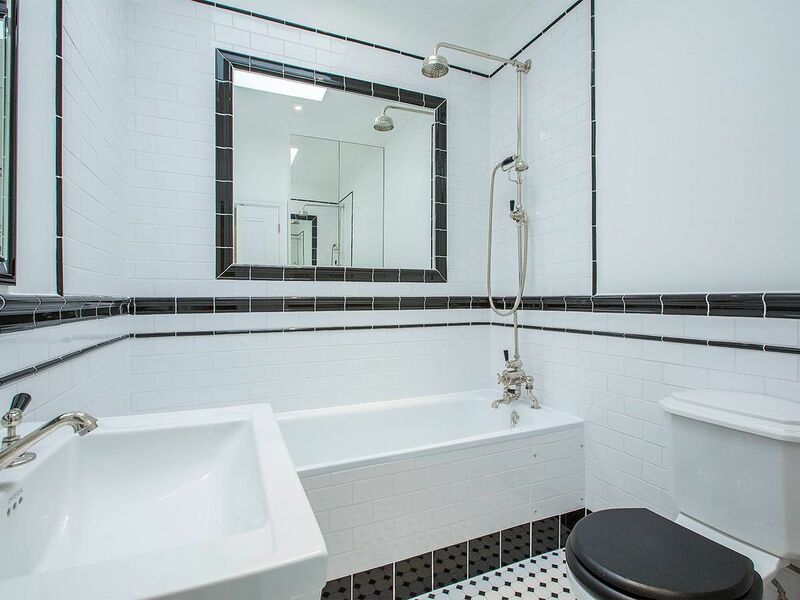 There are two bathrooms decorated in a traditional art deco style. The en-suite bathroom has a designer bath/power shower mixer and the second bathroom room is also equipped with a power shower. Both have the benefit of thermostatically controlled underfloor heating. Toiletries such as soap, shower gel, shampoo and conditioner are provided, as well as a hairdryer. Last but not least, there is a roof access straight from the flat (up the stairs from the living room through a fully automated skylight) to a beautiful fully decked roof space. 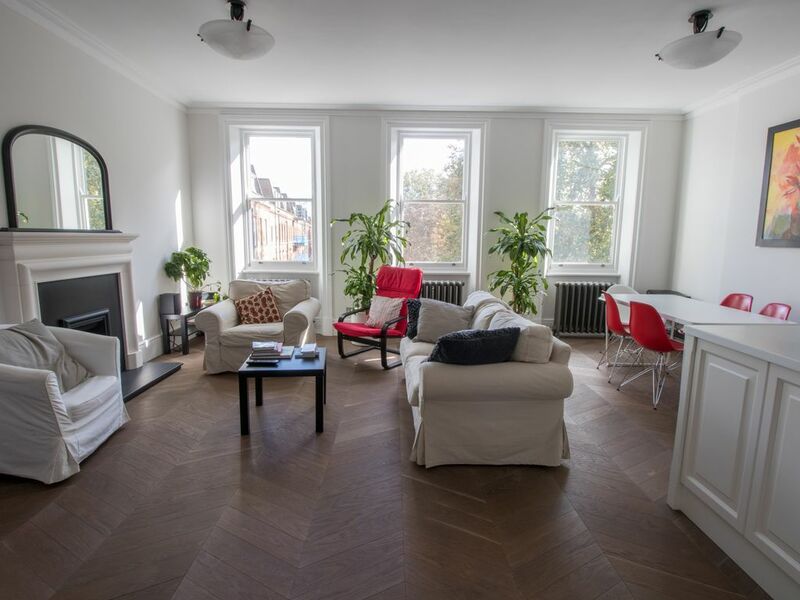 Perfect for spring and summer, but even in wintertime London does get a few sunny dry days and the space is a perfect south-facing sun trap to enjoy the winter sunshine. Please let me know if you need any special arrangements for children, I can provide a baby cot, bath, high chair on request etc. Please bear in mind that there is no lift in this period building and that the flat is a walk-up to second and third floor. I would be very happy to help you with restaurant/sightseeing/other activities recommendations. There is so much going on in London and time is precious so would be delighted to share my knowledge and experience with you. HOUSE RULES - STRICTLY NO parties in the apartment! Please keep the noise to the minimum as the house is located in a quiet residential area. - No spiky heels (eg stilettos) on the wooden floor in the living room. - No pets - No smoking in the apartment but please eel free to use the rooftop space THE NEIGHBOURHOOD The flat is very well located with Earls Court tube station (Piccadilly and District Line) only a few minutes away, which means you can get from or to Heathrow Airport in 40 min by direct underground (useful as traffic can be very busy in London during peak hours) or only 25 min by car. Piccadilly Circus, Covent Garden, and the West End are about 20 minutes by the underground. The apartment is also very close to landmarks such as the Natural History Museum, the Science Museum, Royal Albert Hall, V&A Museum are a short distance away. High Street Kensington and Holland Park (great for a morning run!) are about 10 min walking distance and Hyde Park is about 20 min walk. There are a lots of shops in High Street Kensington, anything from designer and high street clothes and homeware brands to antiques. For large-scale grocery shopping, there is a very big Tesco in Cromwell Road (3 min walk from the flat) and Wholefoods in High Street Kensington (15 min walk). Earls Court Road is well served by a variety of shops such as Sainsbury’s Local, Coop, Marks &Spencer Food etc. GETTING AROUND The area is very well served by public transport (underground, overground, buses). There is an NCP car park on the other side of the Cromwell Road (3 min walk to the apartment) - happy to make an inquiry about the charges for you on request. Alternatively, it may be possible to arrange parking with one of the nearby hotels, but please do contact me in advance so I can check if this option is available for your dates. OTHER Please note that the apartment is in a period building in a conservation area and there is no lift access so the access is only by stairs to second and third floor. The apartment enjoys sole access for recreational purposes to the roof space, which also serves as emergency exit. Please exercise utmost caution and care if you need to use this space.